Need a reverb plugin that will add that much-needed vintage “sproing” to your tracks? Or maybe you are looking for a great all-’rounder that can handle everything from drums to vocals, surf guitar jams to spacey Krautrock freak-outs? Read on to find out which the best spring reverb plugin for you! Quick answer: we like the Audiority’s XenoVerb for the top pick, but Softube Spring Reverb is also a very popular choice. And though it’s a little bit pricey, PSP Audioware’s Nexcellence offers the most features. Reverb, in audio engineering, is an artificial audio effect that recreates or approximates the combined effect of sound waves bouncing off surfaces in an acoustic space (Wikipedia definition of reverb at link). 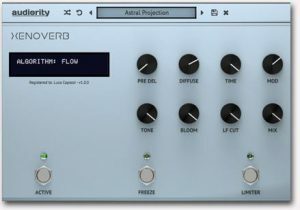 In music or audio production, reverb is typically used on otherwise “dry” or unaffected audio signals in order to create the impression of the sound being present in a particular environment. Now, reverb actually occurs naturally, and is present in most every environment. But in the confines of a typical recording space, reverberant qualities may be less present than is desired or required, or in fact may be totally absent. So audio engineers employ artificial means for generating reverb. Before the advent of digital–and even analog–signal processing technology, studio engineers typically added reverb to sounds by placing the source in a highly reverberant or “echo-ey” space. This was typically a large, empty room with high ceilings and hard wooden walls and floors. But with the advent of signal processing technology and the shift toward smaller studio spaces, most engineers eventually gravitated toward artificial reverb as one of the to go-to plugins to use for music production. Spring reverbs were among the earliest forms of reverbs. Similar in principle to plate reverbs, spring reverbs utilized metal springs instead of a metal plate. This spring vibrates in response to audio signals directed into the mechanism, producing a characteristic metallic sound. The sound produced by spring reverbs had little in common with natural reverb sounds. Nevertheless, the highly reverberant–and sometimes jarring–effect produced was quite distinctive, and was an essential element in early rock-and-roll and surf music. For studio engineers who frequently record acoustic instruments, realism is one of the most important considerations in choosing a reverb plug-in. For these purposes, a particular reverb should approximate the sonic qualities of a particular environment as closely as possible. But authenticity and realism aren’t necessarily suited to every application. In some cases, recording engineers, music producers, and/or artists may prefer the “artificiality” of a plate or spring reverb, or even the totally unnatural qualities of a more complex modulated reverb. Spring and plate reverbs in particular are often sought after for these unique qualities they impart to the sound. You can read more about the different types of reverb by jumping to the bottom of the page. Audiority’s XenoVerb is a versatile reverb plug-in that brings together the best of classic and modern reverb algorithms. Despite its clean and simple interface, it is capable of delivering a remarkably wide range of useable reverbs. A lot of thought and research have clearly gone into the development of each algorithm, and the overall design is marked by remarkable attention to detail. Practically any type of acoustic space can be dialed in with the XenoVerb, making it so much more than your typical spring reverb emulation. Among the most common praises for XenoVerb are its flexibility and high-quality algorithms. Capable of delivering an exceedingly wide range of reverbs from the traditional to the futuristic, it is nevertheless remarkably easy to operate. Many users have in fact expressed amazement at how so much capability has been packed into such a reasonably-priced reverb plug-in. Perhaps the one thing that XenoVerb lacks to push it over the edge is a width knob. With the addition of this somewhat ubiquitous feature, what is an already tremendously versatile reverb processor would be even more useful and flexible. As it is, few reverb plug-ins come close to the combination of simplicity and state-of-the-art features that XenoVerb provides, and it is definitely a winner in our books. Softube’s Spring Reverb aimed at providing as close to an authentic, vintage spring reverb effect as possible with this unit. Gritty and full of character, it contrasts sharply with the slick and polished “studio-quality” reverbs that have inundated the market as of late. The plug-in makes no pretenses of being anything other than a thick and juicy approximation of the dripping-wet reverb sound that has graced countless classic tracks over the years. It even has a “shake” control that approximates the harsh “clang!” produced by a guitar amplifier when kicked by an over-jubilant rock star! Softube’s Spring Reverb has quite a bit of accolades from hobbyist as well as from seasoned pros. It has been used by producers and engineers on the projects of such artists as Adele, Metallica, Red Hot Chili Peppers, and U2. One producer in particular pitted the Spring Reverb head-to-head against an AKG BX20, considered by many to be the holy grail of spring reverbs. After logging hundreds of hours comparing the two, this producer retired his venerable BX, and now uses the Softube Spring Reverb exclusively. Softube Spring Reverb is a deceptively simple and yet effective reverb that brings that coveted vintage flavor to any production. Some users have complained about the exaggerated quality of the spring reverb approximation, but reviews tend to be generally positive. Developed by PSP Audioware, SpringBox is a plug-in emulation of a hardware spring reverberator device. Its features aim to replicate some of the most recognizable characteristics of spring reverb units, among them the “boing” effect on transient signals. It also has a repeat control for musical resonance, with a separate presence control. The SpringBox can be configured with two to six springs, with the stereo spread and pan/balance control providing utmost flexibility for use in insert and send applications. 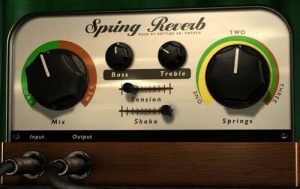 Many users have lauded the SpringBox’s ability to provide the classic character of a spring reverb with the precise parameter control of a plugin. It has been used by producers working in a wide variety of styles, although interestingly, it seems to be surprisingly popular among hip-hop producers. In any case, many users have noted the SpringBox’s usefulness not just on guitar, but on most other instruments and sound sources as well. The SpringBox is an easy to configure spring reverb plug-in with effective stereo routing and versatile spread and diffusion controls. Equally capable of processing drums and guitars, it is somewhat let down by the inability to custom tailor each spring individually and by the less-than-useful A/B option. Overloud’s SpringAge represents a significant departure from now-familiar spring reverb simulation with its combination of convolution and algorithmic technology. Merging the best qualities of both signal processing approaches, it aims to replicate the tone and dynamics of an authentic spring reverb device. SpringAge comes with three spring models, each inspired by some of the most iconic reverb units in recording history. Suitable for use with vintage and modern equipment, it is equally effective on guitars, vocals, keyboards, synthesizers, and drums. 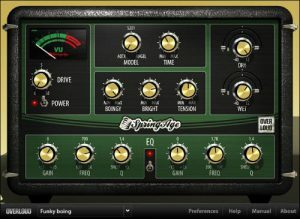 SpringAge seems to have garnered quite a following with its unique approach to spring reverb emulation. Many users have compared it favorably to Softube’s Spring Reverb, highlighting the added advantage of its versatile and detailed parameter control. The flexibility of unit clearly seems to have won fans over, with many appreciating the ability to overdrive the preamp section. The two-band parametric EQ has also been praised for its ability to tailor the reverb for specific guitar or vocal applications. SpringAge score points for its realistic spring reverb approximation, with the added control over the drive being the icing on the cake. Some users have complained about the relatively limited range of sounds possible, and the inability to push the boingy and tension controls to the extreme. Nevertheless, the general consensus is that SpringAge provides very reasonable value for the money. Already having garnered rave reviews for the SpringBox, PSP Audioware came out another contender in the spring reverb plug-in arena. Called Nexcellence, this new plug-in draws inspiration from the “necklace-type” spring reverb mechanisms fitted into Hammond organs in the 1960s. With the addition of a whole new set of features such as two spring processor engines, extended parameter control, and an opto-limiter circuit, Nexcellence is just as suited to modern applications as it is to classics-oriented projects. One of the most common praises directed toward Nexcellence is its ability to bring forth the best qualities of plate, room, and spring reverbs. Closer to an all-purpose reverb than to the typical spring reverb emulation, it is equally capable of adding depth and subtle warmth to electric guitar and drums. As compared to the SpringBox, some users have claimed that Nexcellence is “cleaner” and “more hi-fi”. Nexcellence is almost like having two spring reverbs in one, with Set I providing a brighter, yet deeper and more sustain-ey flavor to the dark and vintage-ey character of Set II. Each Set can be used individually, but combining the two definitely provides even more tonal possibilities. Considered remarkably rich, vibrant, and complex, the Nexcellence is equally at home acoustic, vocal, electric, and electronic tracks. About the only faults we could find with it are the somewhat high price tag and the absence of a bypass switch for the “feed” feature. Five quality reverbs, one or two of which are about as different from the others as can be…so how do you choose which is the best spring reverb plugin to add to your arsenal? When making your decision, it might be helpful to first define your sonic goals. Are you looking for the classic “boing”-ey drip of vintage spring reverb? If so, Softube’s Spring Reverb, PSP’s SpringBox, and Overloud’s SpringAge are all worthy of consideration. If all you want is thick swathes of wet reverb coupled with a relatively simple user interface, you really can’t go wrong with any one of these. On the other hand, if you want a bit more versatility for contemporary musical stylings and acoustic recordings, the simplicity of those units might leave you wanting. If that is the case, PSP’s Nexcellence and Audiority’s XenoVerb might be more to your liking. Both up the ante in terms of versatility and features, and yet remain very easy to use. In addition, they both sound excellent over a wide variety of applications, making them capable of so much more than your livening up your surf rock guitar tracks. Considering that all these reverbs sound pretty darn good, were going to have to go with features and capabilities. This time around, Audiority’s XenoVerb beats out the competiton due to its sheer flexibility, comprehensive set of useful features, and its ability to sonically measure up to the best hardware reverbs on the market. Over the years, a number of different types of hardware reverbs were developed, with names that reflected their form, function, or supposed sonic qualities. These different types of reverbs were later replicated or approximated in software. Room reverbs are descended from the actual echo chambers used to create the earliest artificial reverb effects. Most such reverbs attempt to simulate the effect of a sound existing in an enclosed space. Hall and chamber reverbs are often simply ‘larger’-sounding versions of room reverbs, with other tonal qualities possibly emphasized or de-emphasized. They may have more high- or low-frequency content (“bright” or “dark”, respectively), for example, or they may exhibit other sonic characteristics. Plate reverbs are approximations of the EMT 140 reverb unit that was introduced in 1957. Fixtures in many big-name commercial studios in the 1960s to the 1970s, plate reverbs utilize a system of transducers attached to a large sheet metal ‘plate’. This plate vibrates in response to audio signals directed through the transducers, producing a distinct reverb effect. Plate reverbs typically produce a bright and clear sound, and are stilled favored for their unique sonic imprint to this day.